It's time now to check in with Richard Bernstein, who sings Sancho Panza in the Sunday/Friday performances of Don Quichotte. Bernstein, who made his Seattle Opera debut in the fall of 1997 as Mozart's Figaro, reflects on recent adventures at the Met, on his Quichotte colleagues (both human and equine), and on the most unusual performance of his career so far. You came to our Don Quichotte rehearsals directly from New York, where you were performing in Simon Boccanegra at the Met. Can you tell us a little about your experience of that production, which many of our readers saw on HD Simulcast? Or about the Fanciulla before that? Both Simon Boccanegra and La Fanciulla del West are elaborate traditional productions by the Italian director Giancarlo del Monaco and great to be a part of. I had the privilege of singing Bello this season on the Met's live in HD Simulcast of Fanciulla and last season I sang Pietro in Simon Boccanegra in the HD Simulcast as well as just performing the role at the Met this season before I arrived in Seattle. In fact, Speight was very gracious in allowing me to come a week late to staging rehearsals here in Seattle as I was singing Pietro in Simon Boccanegra at the Met when rehearsals of Don Quichotte began here. It is a thrill being involved in the Met's Live in HD series and an honor as well as the operas are usually released onto DVD. This can be a little nerve racking as well as it is 100% live, and you only have one shot at it! 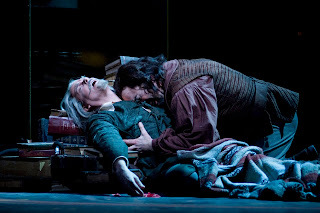 The production of Simon Boccanegra was especially exciting this season as Dmitiri Hvorostovsky was just phenomenal in the title role, and Ferruccio Furlanetto was flawless as Fiesco and an inspiration to listen to and watch. 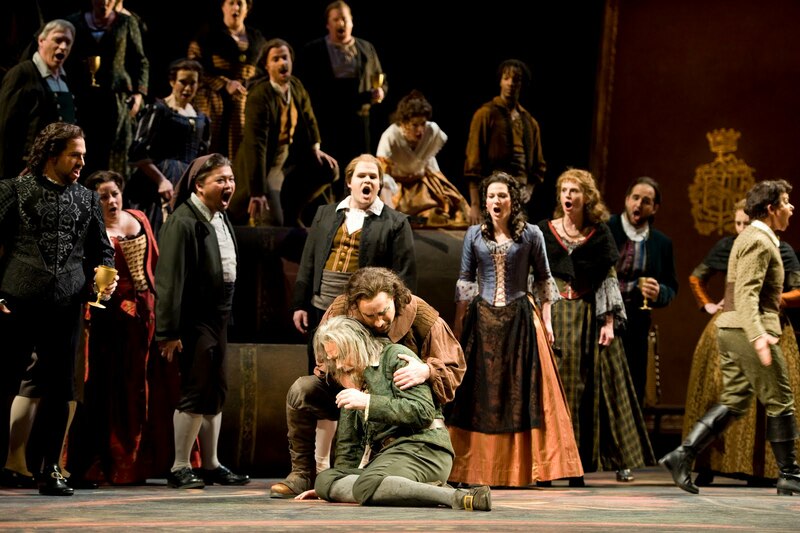 It is also one of Maestro Levine's favorite operas and it was very special for me to be involved in this production. Last year, on the HD Simulcast Placido Domingo sang Simon Boccanegra, and he was simply a complete force of nature on stage, especially in the Met's elaborate staging of the Council Chamber scene. I will never forget the electricity that he exuded in that scene and the humanity that he brought to the role. Next season, I will sing the role of Lord Krishna in Satyagraha by Philip Glass that will also be presented in the Met'S Live in HD series so plan on coming to see that next November at your local movie theater if you can't get to New York. It seems as if the Met has been doing less conservative productions in the past couple years. Would you describe Seattle Opera’s production of Don Quichotte as traditional, or more radical, or don’t those terms apply? I'm not sure that these terms apply as this isn't really a classically traditional production nor is it radical. To quote Linda Brovsky the director, it is more of a conceptual and theatrically based approach to a production. What is most important to me as a singing actor are that the relationships are real and true to life. In this production Linda creates that completely. 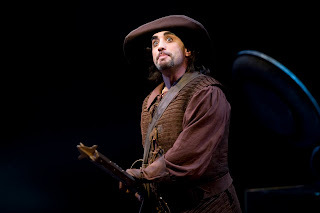 Basically, I am onstage almost always alone with Don Quichotte throughout the opera. The relationship that Linda created between us is true to the Cervantes text and true to what Massenet wrote and asked for in his score. 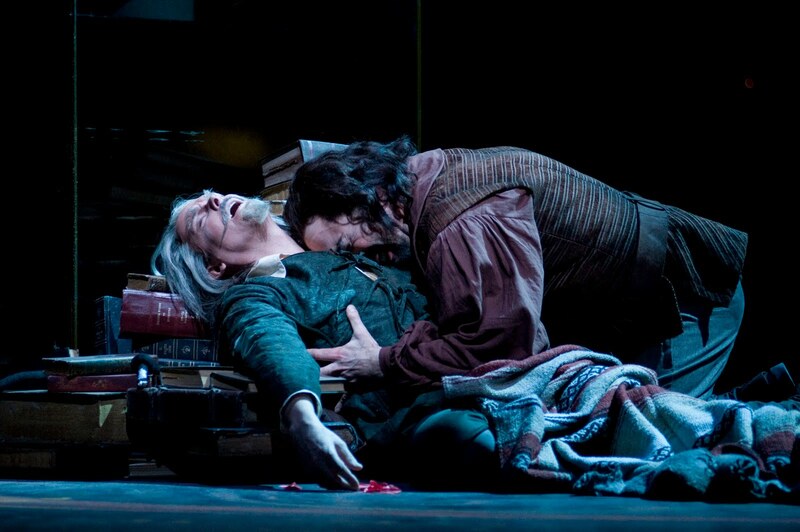 It was real and torturous for me emotionally at every rehearsal and performance when I lose him at the end of the opera. Linda did a brilliant job on this production and especially patient with me in helping me re-create the role of Sancho and lead me on the journey. I am very grateful to her. You share the stage, in Don Quichotte, with quite a cast. 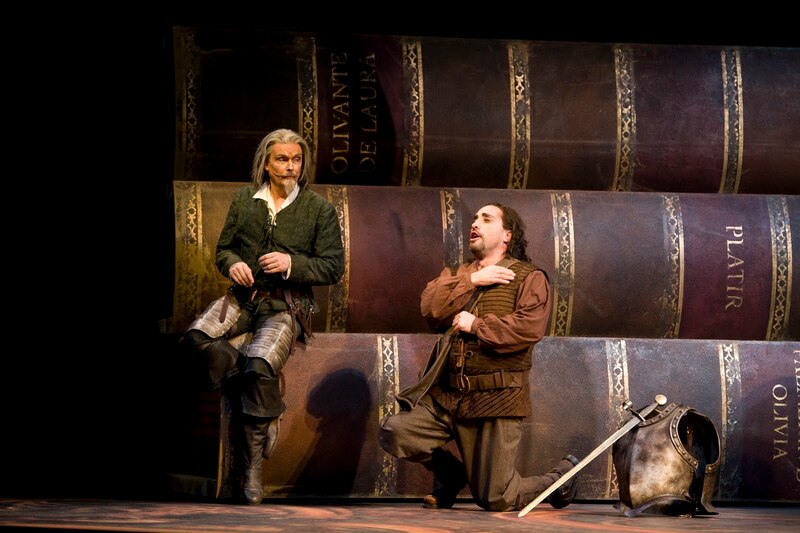 What’s it like to have three other bass-baritones as colleagues (Nicolas Cavallier, John Relyea, and Eduardo Chama)? 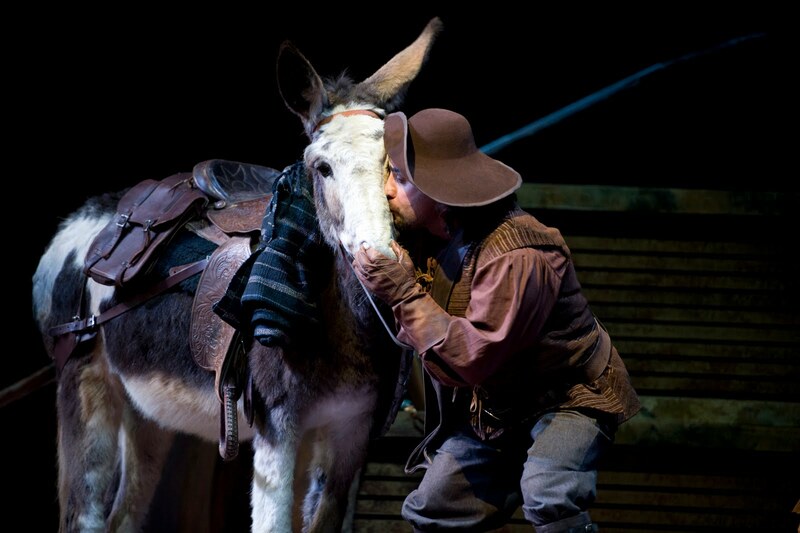 Do you like working with that notorious scene-stealer, Millie the Donkey? It's been terrific working with Nicolas, John and Eduardo! They are all great guys and we have enjoyed getting to know each other during the rehearsal process and spending time together outside of the theater. John and I have worked together a few times at the Met and Chicago, most recently just a few months ago in Carmen where he did a stellar job as Escamillo and I sang Zuniga. 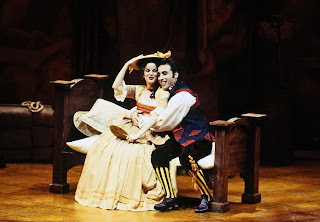 Eduardo and I have worked together before in Florence, Italy about 7 years ago, doing Le nozze di Figaro where I sang Figaro and he sang Bartolo. This is my first time working with Nicolas and it has been a great pleasure for me. He is simply terrific as Don Quichotte and I have enjoyed very much working with him and getting to know him. Now Millie...that was love at first sight when I first met her 3 weeks ago! She is a lot of fun to sing to and ride on stage. I have always loved horses, now I love donkeys too! You previously performed the role of Sancho Panza at the Klangbogen Festival. Can you tell us a little more about this festival? What was that production of Quichotte like, and how does it differ from what we’re doing here? The Klangbogen Festival is a wonderful festival in Vienna during July and August that puts on a wide variety of operas from contemporary modern operas to the classics. I had the pleasure of making my debut in Vienna in an ultra modern production of Don Quichotte that was performed at the Theater and der Wien. This is the same theater that Beethoven had the premiere of his opera Fidelio in 1805. While that production in Vienna was thrilling to be a part of and a great experience, it was ultra-modern in every respect, with Don Quichotte set as a caricature of a clown in all white. I sang Sancho in a cut-out donkey with a top hat on. Both Don Quichotte and Sancho Panza had cut-out models of our animals, not like the real Millie and Desperado here in Seattle. This has been so much fun. This production here in Seattle is true to the text and period while also being and fresh, vital and real. I enjoy being involved in vibrant, realistic, and authentic productions such as this one and have really enjoyed on working with Linda Brovsky on the role of Sancho. It's been delightful working with Maestro Montanaro as well. It’s been a while since you last sang at Seattle Opera. Did the city seen very different when you first returned? Is there anything you’re excited to do in Seattle during your free time? The city seems to have grown and expanded since I was last here! So many terrific restaurants and areas to visit. I'm having a terrific time exploring Seattle with my wife and 3 children enjoying all the sites. We have gone to to the Museum of Flight, the Aquarium, the Zoo,the Science Museum, and the Children's Museum. There are so many fun and exciting places for children, and so much to do and see. I'm just sad that my family is leaving on Wednesday. On one day before my family arrived, I rented a car one day with no map and no gps and ended up driving to West Seattle. As I was turing a curve I saw a ferry entrance, and decided to be "spontaneous" I paid the fare and ended up on Vashon! I had a great excursion there and ended up having a burger at the restaurant The Hardware Store. I am also a private pilot, and I was just fascinated by the Boeing tour in Everett. I plan to go back again with my son Joshua this week. On another day, Jan Asbjornsen, who is an Artist Aide for the Seattle Opera and also a full time Project Manager at Starbucks, gave me a phenomenal private tour of the company. I had a fantastic time, getting a behind-the-scenes tour at my favorite coffee company! Some years ago there was a concert Don Giovanni up in Bellingham where you ended up singing the roles of both Leporello and Masetto. Has anything else that unusual happened to you in your career, or is that the weirdest thing you’ve experienced? A VERY interesting interview, including Bernstein's comments on his fellow singers in different productions. His description of the disastrous "Quichotte" in Wien made me all-the-more grateful that Speight engaged Linda Brovsky to stage it here!!!! Actually, I've liked EVERYthing Brovsky has staged in Seattle during the periods I'm in Seattle. By the way, I GREATLY appreciate this Blogspot, as it is one way I can keep up with SeattleOpera when I'm FAR away in Schwerin, Germany. My other very good source on Seattle classical music is "www.gatheringnote.com"!! Thanks to you, Jon for your substantial (and successful) work on this blogspot and for informing me of it one day you were volunteering for the SIFF!!!! Thanks for keeping up with us, Win...and for all your enthusiasm!